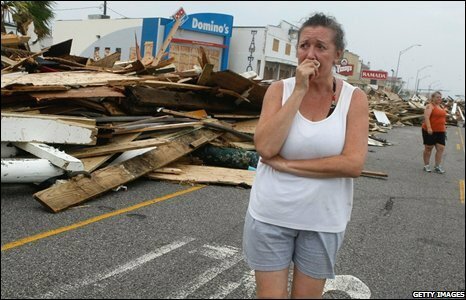 A tearful woman surveys the carnage left by Hurricane Ike, which smashed into America's Texas Gulf Coast on Saturday. 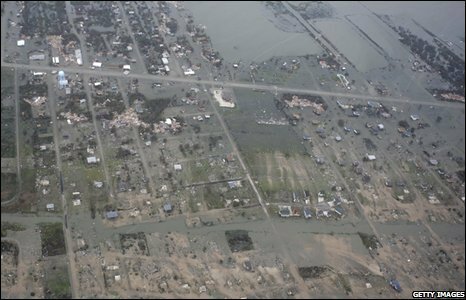 An aerial view of Crystal Beach, near the coastal city of Galveston, which took the brunt of the Category Two storm, captures the scale of the devastation. 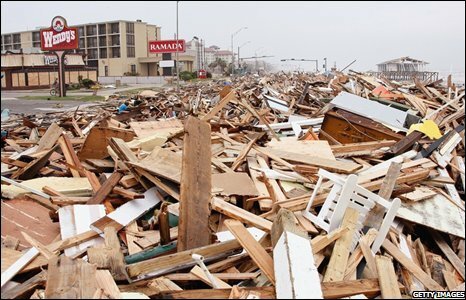 The storm, which caused up to 80 deaths in the Caribbean last week, reduced swathes of Galveston's seafront to matchwood and left the city without water or electricity. 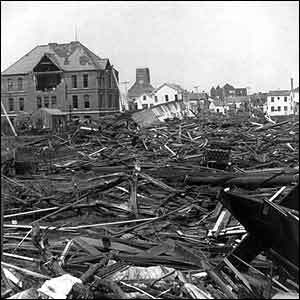 The destruction evoked comparisons with a storm that battered the city in 1900. There are reports of a couple of deaths in Texas, but nothing like the 8,000 lives claimed by the hurricane 108 years ago. 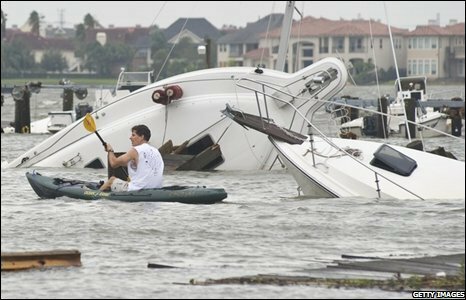 Ike tossed boats about like children’s toys. 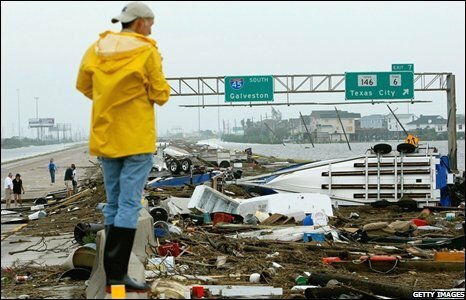 US President George W Bush declared Texas a federal disaster zone. 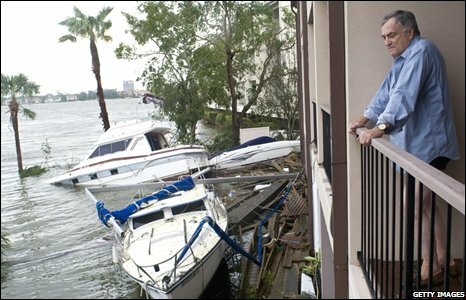 There were more insurance claims in store for boat owners up the coast at Nassau Bay. Nearby, Ike also damaged the roof at Nasa's Johnson Space Center Mission Control. Rescuers are using boats, high-wheel lorries and helicopters to rescue thousands of people who ignored an evacuation order. 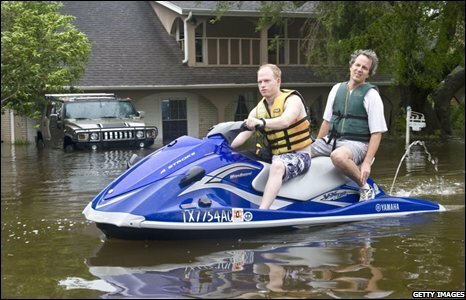 These residents had a jet ski handy to get around their neighbourhood. 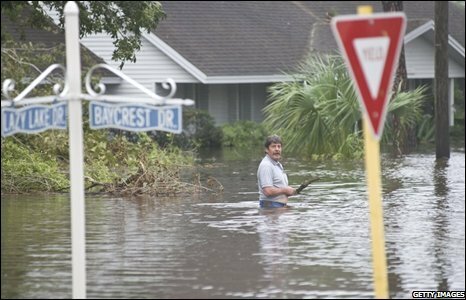 But many had to wade through the flood waters. 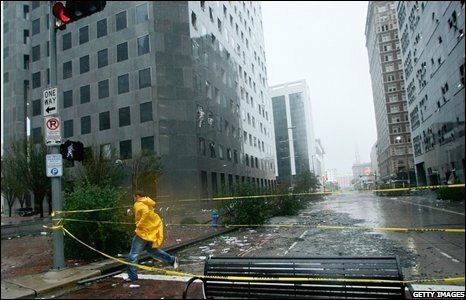 Ike is estimated to have caused billions of dollars of damage but appears to have been less destructive than originally feared. In Houston city the storm shattered skyscraper windows, showering streets with glass and debris, tore apart bus shelters and ripped metal sheets off buildings. As residents were left to count the cost, Ike weakened to a tropical depression as it headed across western Arkansas on Sunday.